Dr Hafiji is on the General Medical Council’s Specialist register (4693338) as a Consultant Dermatologist acknowledging his expertise in all conditions relating to the skin. 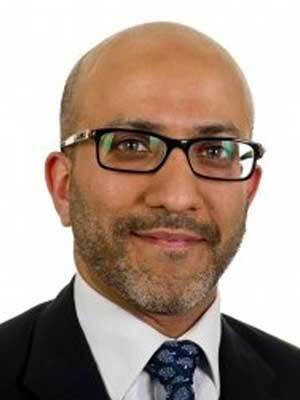 Dr Hafiji has been the Surgical Lead of the Department of Dermatology at East Kent Hospitals University NHS Foundation Trust where he was instrumental in developing the dermatologic surgery service. University of Leicester and undertook his postgraduate training at the Heart of England NHS Foundation Trust, Birmingham. Dr Hafiji is a Fellow of the American College of Mohs Surgery, Fellow of the Royal College of Physicians (UK) and Fellow of the Royal Australasian College of Physicians. Upon completion of his dermatology training at Cambridge University Hospitals, he was awarded the Certificate of Completion of Training (CCT) by the Joint Royal Colleges of Physicians Training Board. Dr Hafiji is a member of the British Society for Dermatological Surgery, British Association of Dermatologists, British Cosmetic Dermatology Group, American Academy of Dermatology, European Association of Dermatology & Venereology and the Royal Society of Medicine (London). Hafiji J. Update on Skin Cancer: reference guide for general practitioners. BMJ publication. March 2016. In press. Hafiji J, Hussain W, Salmon P. Mohs surgery spares orbicularis oris muscle optimising cosmetic and functional outcomes for tumours in the perioral location: a series of 407 cases and reconstructions by dermatologic surgeons. Br J Dermatol 2015; 172(1):145-50. Hafiji J, Hussain W, Salmon P. Reconstruction of perioral defects post Mohs micrographic surgery: a dermatological surgeon’s approach. Br J Dermatol 2015; 172(1) 294-6. Hafiji J, Rytina E, Jani P, Burrows, NP. A rare cutaneous presentation of metastatic parotid adenocarcinoma. Australas J Dermatol 2013; 54(2):e40-2. Hussain W, Salmon P, Hafiji J. Reply to: “The bilobed flap versus the AIRNS flap for repair of distal nose defects”. J Am Acad Dermatol 2013; 68(4):685-6. Hafiji J, Salmon P, Hussain W. The AIRNS flap – an alternative to the bilobed flap for the repair of defects of the distal nose. J Am Acad Dermatol 2012; 67(4):712-6. Hafiji J, Salmon P, Hussain W. Patient satisfaction with post-operative telephone calls after Mohs micrographic surgery: a New Zealand and U.K. experience. Br J Dermatol 2012; 167(3):570-4. Hussain W, Hafiji J, Salmon P. The utility of the “book biopsy” in Mohs micrographic surgery. Br J Dermatol 2012; 167(3):701-3. Hafiji J, Rytina E, Burrows NP. The spectrum of spitzoid tumours: a clinical study. Australas J Dermatol 2012; 53(3):211-5. Hussain W, Hafiji J, Salmon P. Optimising adherence of full-thickness skin grafts to the wound bed of the nasal alar with the “sandwich suture”. Br J Dermatol 2012; 167(2): 447-8. Hussain W, Hafiji J, Salmon P. The naso-facial sulcus as a primary donor site for full-thickness skin grafts of the nasal alar and distal nose. Dermatol Surg 2012; 38(6):926-8. Hafiji J, Hussain W, Tallon B, Salmon P. Optimising the shave excision technique to aid accurate histological diagnosis. Br J Dermatol 2012; 166(1):226-227. Hussain W, Hafiji J, Salmon P. Frontalis-based island pedicle flaps for the single-stage repair of large defects on the forehead and frontal scalp. Br J Dermatol 2012; 166(4):771-4. Hafiji J, Salmon P, Hussain W. Modifying the S-plasty to optimise a curvilinear scar. Clin Exp Dermatol 2012; 37(2):199-200. Skellett AM, Hafiji J, Greenberg DC, Wright KA, NJ Levell. The incidence of basal cell carcinoma in the under 30s in the U.K. Clin Exp Dermatol 2012; 37(3):227-229. Hafiji J. Update on Psoriasis: reference guide for general practitioners. BMJ publication March 2016. In press. Hafiji J, Deegan P, Brais R, Norris P. Warfarin-induced calciphylaxis successfully treated with sodium thiosuphate. Australas J Dermatol 2013; 54(2):133-5. Hafiji J, Hook CE, Burrows NP. Hyperkeratotic papules in a child with Down syndrome. Pediatr Dermatol 2011; 28(1):53-4. Hague JS, Kaur MR, Hafiji J, Carr RA, Lewis H, Heagerty A, Orpin SD. Two cases of pustular toxic epidermal necrolysis. Clin Exp Dermatol 2011; 36(1):42-5. Hafiji J, Bhogal B, Rytina, Burrows NP. Bullous pemphigoid in infancy developing after the first vaccination. Clin Exp Dermatol 2010; 35(8):940-1. Hafiji J, Sonnex C, Rytina E, Sterling JC. A rare case of vulval pustulation in rosacea fulminans. Clin Exp Dermatol 2010; 35(6):670-2. Hafiji J, Orpin S, Roberts C, Heagerty A, Lewis H. Radiotherapy: a protective role for toxic epidermal necrolysis? Br J Dermatol 2010; 162(5):1139-41. Hafiji J, Batchelor JM. Red in the face. BMJ 2010; 340:b5643. Hafiji J, Majumudar V, Matthews S, Rytina E, Burrows NP. A rare case of bromoderma and bromism. Br J Dermatol 2008; 158 (2):427-429. Orpin S, Hafiji J, Goodyear H, Salim A. Ingestion of topical steroid triggering pustular psoriasis? Br J Dermatol 2005; 153 (3):680-2. Hussain W, Hafiji J, Stanley A, Khan K. Dermatology and junior doctors: an evaluation of education, perceptions and competencies. Br J Dermatol 2008; 159 (2):505-506.